An interesting and diverse main character. Elyse is from Tobago in the Caribbean and it is so refreshing and really interesting to read about her culture from her point of view. A realistic take on trauma and finding your way. Elyse lost her voice in a mysterious accident and is now dealing with consequences. All her life she wanted to be a singer and now that that is taken away from her, she is suffering. There are steps forward and steps backward and there is no ‘love heals all’ thing going on, which I loved for its’ realism. A fairytale retelling vibe. I loved all the ‘The Little Mermaid’ references and the mermaid festival seems so cute that I wish I could go there someday. A cute romance that combines some of my favorite tropes into a whole new and unique concept. There are traces of opposites attract, dislike to love, working on a project together and even a bit of penpal romance with the talking through notes. The absolute cutest 6-year old ever. I absolutely loved Sebastian Kane and I loved the family aspect. I loved his interactions with Christian and Elyse. A lot of focus on equality. Both Elyse and Sebastian have to deal with prejudice. Elyse because she wants to sail in the ‘all-boys’ Pirate Regatta and Sebastian because he wants to march in the ‘all-girls’ mermaid parade. And they both deal with it wonderfully, proving that yes, girls can sail and yes, boys can be a mermaid queen! Both their personal victories had me wooping and cheering along with them. So this book has a lot of great elements and I definitely would recommend you to give it a try if these things appeal to you in any way! However, while I enjoyed all these things, I just did not enjoy the whole as much as I would have liked. I didn’t care about the Regatta. I didn’t care about the romance. It was too long and I got bored. And I feel terrible about it. Maybe I was in the wrong mood set when I read this. Maybe I need to re-read it sometime in the future. But rest assured, I’m sure it’s all me. If this story sounds good to you in any way, please don’t hesitate to give it a try! I hope you will enjoy it so much more than I did. 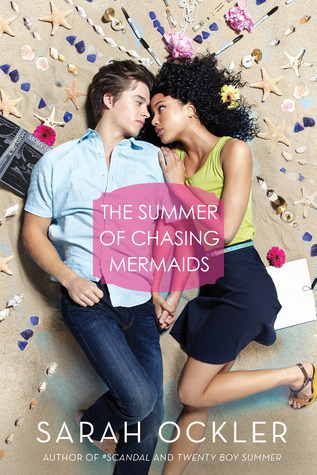 Have you read The Summer of Chasing Mermaids? What did you think about it?